I was tagged by Sheila of Ma Vie Folle for this new meme. Go to your sixth picture folder then pick your sixth picture. Try to remember the details. My pic: This was the table at my sister-in-laws house at Thanksgiving 2000. By this time JL had moved here before we got married. I went with him to be with his family for the holiday. Ironically this is the Thanksgiving that his sister also officially declared Thanksgiving HER holiday forever more. Let’s just say that my husband does NOT agree with this and we have stood our ground some after several years of listening to this statement. We are currently waiting for the annual garbage to begin yet again. Note: I have to admit this was a more "difficult" meme for me since we have SO many different places with photos on our network. Of course I went to our main directory and it landed me in 2000. Within that I then went to the 6th folder and found the 6th photo in that. Tagging: Since I am under the weather I will tag anyone that wants to play. Please just come back here and leave me a link to your Meme to the 6th so I can come and visit. Sorry to hear you’re not feeling well, still! Now, about your photo. 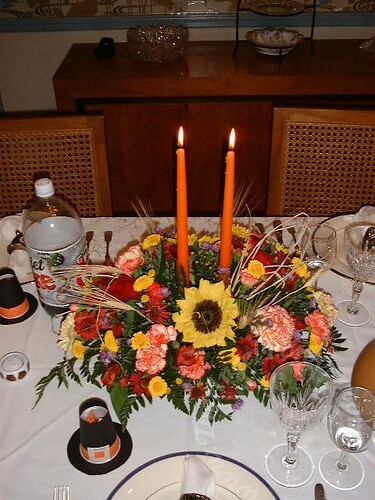 Is this like a Martha Stewart relative (that centerpiece!)? We trade off for holidays with Shane’s family. It’s too bad your in laws wouldn’t do something like that. Sounds very, very selfish. Maybe you’ll get to the point of ‘well, we’re going to just stay home this year…everyone is welcomed to stop by’. (And save your sanity).